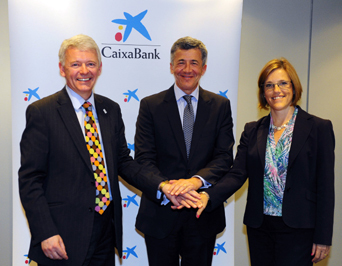 CaixaBank, Pompeu Fabra University (UPF) and the Chartered Institute for Securities & Investment (CISI) have signed an agreement whereby both institutions will certify the Financial Advice training of directors and personal banking managers of CaixaBank. Present at the signing ceremony, which took place at CaixaBank’s headquarters in Barcelona, were: Francesc Xavier Coll Escursell – Deputy Director General and Head of HR, Simon Culhane, Chartered FCSI and CISI CEO, Carme Martinell, Director General Private Foundation Institute of Continuing Education at the Pompeu Fabra University. Following this agreement, CaixaBank employees who take the UPF Barcelona School of Management’s training course in Financial Advice, which lasts for a period of two years, and who pass the final exam will receive two qualifications: the Diploma in Financial Advice from IDEC (UPF) and the Certificate in Wealth Management (Spain) from the CISI. Currently more than 5,000 directors and personal banking managers are doing this course and will be examined next November. In addition, CaixaBank anticipates regulatory requirements that will occur with the arrival of the Banking Union and will be the first Spanish bank to certify the training of their employees both nationally and internationally. The UPF Barcelona School of Management is the business school of Pompeu Fabra University, a leader in the training of professionals in the banking sector in Spain and the only Spanish university on the Times Higher Education (THE) world ranking. The Barcelona School of Management (UPF) Diploma in Financial Advice is a course that carries 30 ECTS (European Credit Transdermal System), the system adopted by all universities in European Higher Education to ensure consistency and quality of studies provided. For its part, the Certificate in Wealth Management (Spain) is a hallmark of excellence, accredited by the CISI, which is recognised by the maximum regulatory body in Europe, the Financial Conduct Authority (FCA), and the main reference of the financial sector worldwide.